#1 – Wash Your Hands! One major step to health is as simple as basic hygiene, specifically, hand washing. Remember what your mother and grandmother nagged you about? They were right. Not washing your hands is one of the easiest ways to get sick. Use dirty hands to touch a surface and then touch your face or touch your food, and the flu virus has a direct path to your nose, mouth and respiratory system. How fast do viruses spread? One study tested households were infants had the polio vaccine. After vaccination, the polio virus is excreted through in feces. 15% of bathroom samples, 12% of living room samples showed viral contamination. Old-fashioned soap and water is the best way to clean your hands. We can stop the spread of viruses by simply washing our hands with soap and water for at least 20 seconds. Water by itself flushes contaminants away, and with the addition of the soap to act as a surfactant, very few of those ‘germies’ are left on our hands. If you don’t have access to water and soap, the next best alternative is alcohol based hand sanitizers. The CDC (Center for Disease Control and Prevention) recommends you use one that has at least 60% alcohol. For example, Zylast Broad Spectrum Antimicrobial Antiseptic. Another means our family uses to try and prevent sickness is to combine aloe vera gel and germ fighting essential oil blends. You can find these online, at a local health foods store or through an EO representative. The aloe is used to dilute the essential oil, plus it's good for your skin. The essential oil blend is immune boosting and antibacterial. We apply the mixture before we go out in public or somewhere we risk exposure to sick people. We also use saline nose swabs for flu prevention. This idea is based on the premise that uptake of any viruses does not happen immediately, so hopefully we can dislodge the viruses before they break dormancy. We pour a couple of teaspoons of sea salt into the bottom of a cup, add about a fourth of a cup of water and then add a couple of spritzes of colloidal silver. Using q-tips, we swab our noses with the solution. We proceed to blow our noses and then –wait for it– wash our hands! Colloidal silver, used according to the instructions on the bottle, also provides a line of defense against microorganisms. Regular consumption of probiotics and live culture foods has been shown to reduce the risk of illness and speed recovery if you do get sick. A healthy human body has ten bacteria cells for every one human cell. If we get exposed to too many antibiotics – prescription medication, antibacterial soaps, glyphosate residue on foods (RoundUp was originally patented as an antibiotic before it was used as a weed killer) – this throws our human/bacteria ratio out of balance. Those missing bacteria are a critical part of our immune system (much of which lives in our guts). If all the living spaces in our body are filled with the good guys, there’s no room for the bad guys. To help fill up those spots with “good guys”, we can take probiotic supplements and/or eat probiotic (live culture) foods such as yogurt, kefir, kombucha, raw kraut or others. To learn more about using good bacteria to keep you healthy, check out “Probiotics for Colds and Flu – Fewer Symptoms, Faster Recovery Time”. The best offense may be a good defense– a healthy, high-functioning immune system. Here we apply common sense– a balanced diet, good sleep habits, and judicious use of supplements. Extra Vitamin C and D and zinc can help ward off infections. 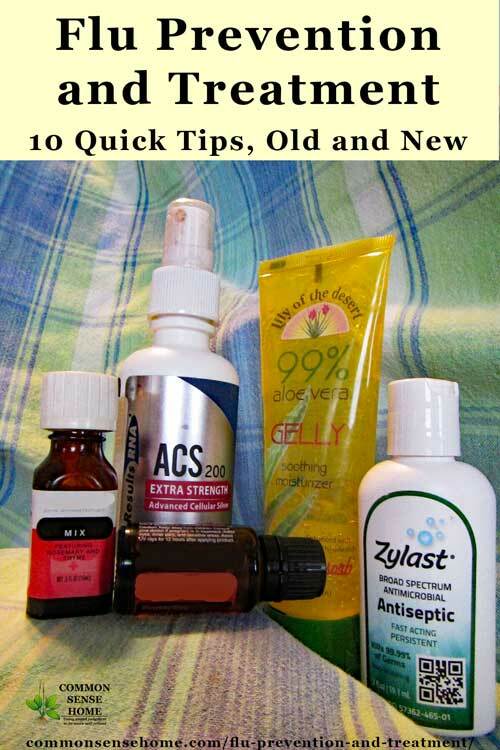 See “The Best Supplements to Prevent and Treat Cold and Flu” for more detailed information. Garlic is antibacterial and an immune system stimulant, and is therefore very beneficial for ridding the disease from your system. Eat a clove of garlic each day (or more) to boost your immune system and fight off cold and flu. Learn how to grow your own garlic with the article “How to Grow Garlic in the Garden – Easy Guide to Growing Garlic“. A pleasant strategy for staying healthy is to take elderberry syrup. You can buy commercial preparations or make your own. Elderberry syrup is immune boosting and helps you fight off colds and other illness. It is recommended that you take 1 tablespoon a day to keep your immune system in top shape. When actively sick, you can increase your intake to a tablespoon every couple of hours. Elderberry has shown effectiveness in double blind studies to reduce severity of cold and flu symptoms. 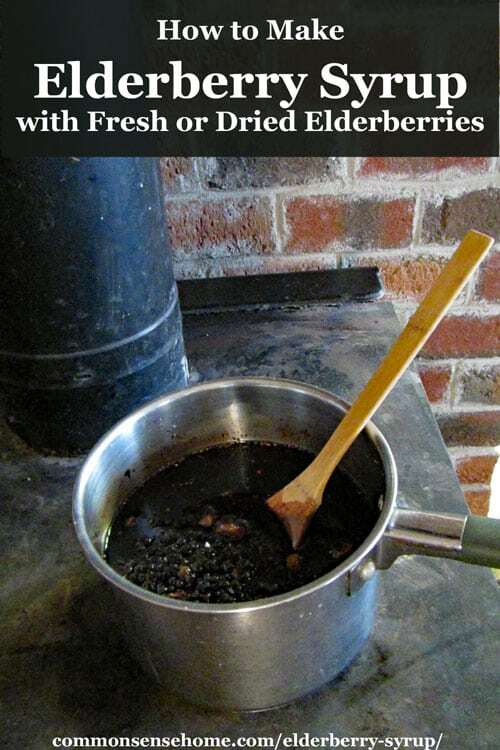 For elderberry syrup recipes and more information on the elderberry syrup studies, see “How to Make Elderberry Syrup”. We recently purchased echinacea, pelargonium, and andrographis for when we we might be at risk or are exhibiting symptoms of respiratory infection. Echinacea is most effective when taken at the beginning of an illness. Echinacea was found to reduce the strength and duration of cold type symptoms by about half. In one of the first studies, it was able to stop the viral infections almost immediately. In reality, these herbs stimulate and support our own defense mechanisms. They are not magic! Echinacea is one of the most studied herbs of recent times. It's available in tea and supplement form. You can even sneak it into finger gelatin to make it easier to give to children. One caution: Echinacea is in the same horticultural family as sunflowers. If you have seasonal allergies, proceed with caution to watch for possible allergic reactions. Pelargonium is antibacterial, antiviral and has expectorant properties. This physically attacks viruses and bacteria plus helps to build the immune system. Pelargonium is also effective in treating other respiratory illnesses, such as bronchitis. Many of our arsenal of herbal preparations function to aid the immune response. This is true of pelargonium, but it is unusual in that it directly attacks infection causing agents, according to Terry Lemorande of Terry’s Naturally. This herb, also known by its African name of umckaloabo, is the most widely used over the counter remedy in Germany. Its effects do not just apply to cold symptoms, but it is widely used for influenza as well. This formulation is sold at our chiropractor’s office. Andrographis is another unusual herb that is proven to cut cold symptoms such as runny nose and sore throat. Studies indicate that it cut the intensity of cold symptoms in half by five days. The majority of those tested were completely well within ten days, compared to less than a third in the placebo group. 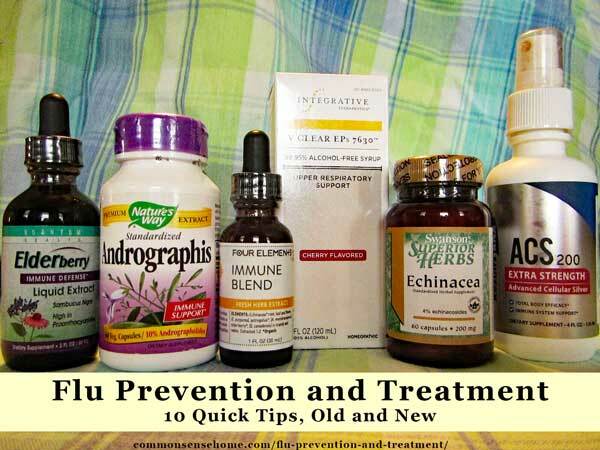 Need More Tips for Flu Prevention and Treatment? Remember, stay healthy, happy, and wash your hands! This article was inspired by Terry Lemorande of Terry Naturally. Terry operates a natural health store and website, and does a weekly radio show. 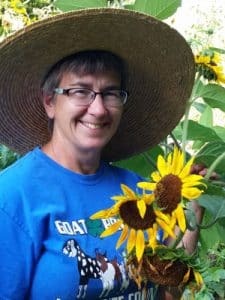 Terry has an outstanding commitment to knowledge of natural remedies. Stop the Stomach Flu – Mom with a PhD in Biochemistry evaluates products and practices for disease prevention. There is a long tradition using herbs for wellness. Now science is finally looking at this library of folk knowledge to study the effects of individual plants. To be definitive, a study must be double-blind and include the use of a placebo. Double blind means that neither the patients nor the main researcher knows who is receiving which compound. The placebo must look and taste like the actual compound being studied. Another critical element is that the compound being studied must be uniform, AKA “standardized”. With herbs, they try to isolate the part of herb they believe is responsible for a treatment. (For instance, a compound that acts as a natural decongestant.) The prepare the herbs they are testing to have matching amounts of that compound. Individual plants or parts of plants can vary greatly in composition. Without standardization, wildly differing results could be obtained. I believe that this lack of ability to standardize herbs has been why older studies of some of these plant medicines have shown lack of effectiveness. Those conducting the tests may or may not have used the correct material. Also, plant compounds don't work in isolation. By standardizing for only one or two compounds, they may miss the action of the whole plant. These studies are expensive and time consuming. If they can isolate a compound and replicate it, there's money to be made. Encouraging people to grow their own medicine in their backyard doesn't pay research costs. It should last several years. If you start to see precipitation of silver particles on the bottom or sides of the bottle, then it’s time for fresh colloidal silver. FOREVER. I use Vicks vapo rub in my nose everytime I leave the house during flu season. I have had the flue 2 times since 1967 hong kong flue. I do NOT take the flue shot and am 70. Just curious: I’ve never heard of Andrographis or Pelargonium. EVER. and I’ve been around the organic, healthy, natural, naturopathic scene for decades. Further explanation and where to find, please? “These were new to me as well when I read about them. Andrographis was ‘discovered’ as part of an investigation of Ayurvedic and Oriental medicines. I was able to get this from Swanson Health Products. Pelargonium is geranium. The origin of its use as a herbal remedy is from African tribal medicine. This was harder for me to find, but I found s syrup of this at my chiropractor’s office. You are more likely to find preparations that include pelargonium if you search the term umcka. Such preparations are also available from Swanson or Amazon. Loved this article. I’ve been making Bragg’s ACV (with the mother) and local organic honey since the late 80s. I mix half and half, keep it in the fridge, and have 2oz with warm water every morning-all year long. If I feel like a cold coming on (when I worked at a big box store-so every day), I would make up a mug and sip on it all day. I also use it in salad dressing which is incredible. I have a colloidal silver machine, so I used to make up small spritz bottles and carry them in my apron. When everyone else was down with the flu or something equally as heinous, I was still working. Now I make it and am using it a few times a day here at the farm. Good for so many things, and much less than having to buy it at the health food store. I pass out bottles to all my farming friends-free. I have another friend with a colloidal silver machine and she swears by it. That’s good of you to share with your friends. I drink warm lemon water almost every morning. Seems to help clear everything out.